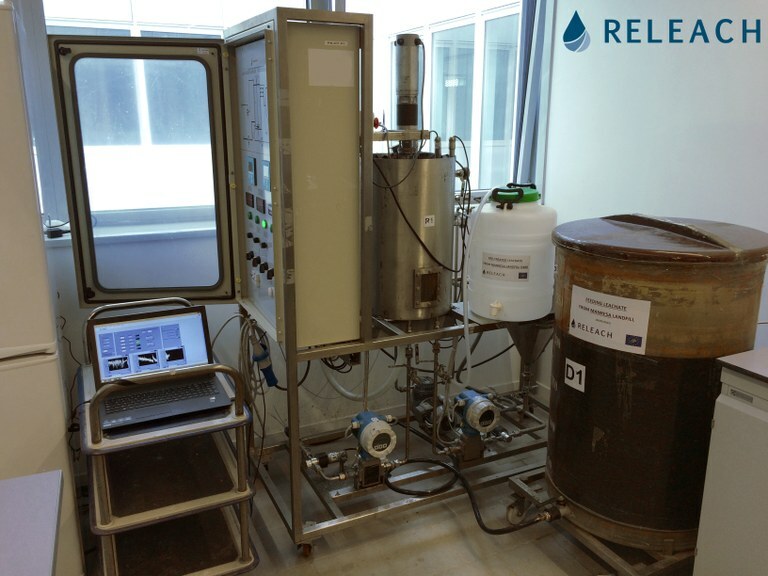 Prior to the membrane concentration stages of the innovative process for treating landfill leachates proposed in RELACH, CTM is now optimizing the biological pre-treatment of the leachate. In order to achieve this purpose, a laboratory scale sequencing batch reactor (SBR) is being operated for an evaluation and optimization of this process step. The biological processes of nitrification and denitrification are probably the most efficient and economical system to remove nitrogen from the leachate, and the SBR system is suited to these processes. The SBR (shown in the picture) is an anoxic-aerobic system used to treat organic and nitrogen compounds in immature leachate; it consists in a five-step operation: filling, anoxic reaction, aerobic reaction, settling and decantation. The main challenges of this stage of the process are the low BOD/COD rate, the high ammonia concentration and the high conductivity of the leachate. That is why the number of cycles, nitrification and denitrification rates, possible inhibitions of these processes, etc. are now being analysed with the aim of stablishing the optimum conditions for operating and collecting the data for the pilot plant design.